In order for social and economic justice to flourish globally, a greater understanding of practice and policy efforts from around the world is essential for today's professional in the human services. International Social Work Policy and Practice provides practitioners and students with contemporary examples and activities to promote in-depth insight and analysis of global social welfare issues such as poverty and the environment. 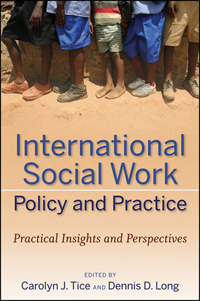 This book examines social work policy and practice within the context of global interdependence and culturally appropriate modes of everyday practice. Its country-by-country coverage follows a consistent structure that, in addition to offering real-life examples, delves into the theoretical underpinnings, ethical dilemmas, policy concerns, and strategies for promoting social and economic justice. Each example of international practice allows readers to immerse themselves in that country's cultural, social, historical, political, and economic context. Reflective exercises and Web-based, interactive activities give readers the chance to connect and apply what they've learned.